A mix of clouds and sun during the morning will give way to cloudy skies this afternoon. High 79F. S winds at less than 5 mph, increasing to 10 to 20 mph..
Cloudy skies early, followed by partial clearing. Low 49F. Winds WNW at 5 to 10 mph. Colorado voters enshrined recreational cannabis in the state constitution in 2012, with the first stores opening in 2014. Together with legal medicinal marijuana, sales burgeoned to $1.3 billion in 2016. That economic clout has led to new influence in the state Legislature, enriched struggling towns, and has helped blaze a path other states have followed. But law enforcement insists that the legal market has sheltered the black market, in which criminals grow cannabis here to sell out of state. The Trump administration has hinted at a possible crackdown. All of this and more in the Gazette's examination of the state of marijuana. In advocating “pot for potholes,” recreational marijuana proponents promised a potent new revenue source for tackling a familiar urban headache. But in Manitou Springs, the only Pikes Peak region community so far to permit recreational pot shops, the cash infusion has meant more than road repairs. Just more than two years after Manitou opened the first of its two retail pot stores in the wake of voter-approved legalization, community leaders credit a booming pot trade for driving a resurgence in the city’s finances — helping to double Manitou’s general fund after back-to-back natural disasters, bankrolling long-hoped-for improvements in its gritty eastern corridor and easing the financial path toward preparing for future disasters. That’s on top of a 2015 initiative that seems like a footnote by comparison — spending $40,000 to fill potholes and seal cracks on Manitou Avenue, the city’s main drag. “That all came about because of marijuana,” said Marcy Morrison, a longtime Manitou resident and veteran policymaker who co-founded the city’s Urban Renewal Authority (URA). The agency has seen its budget rise from an average of $34,000 per year in the four years before legalization to $1.2 million in 2016 thanks to pot tax collections, paving the way for a series of planned improvements. Morrison was a vocal opponent of legalizing recreational marijuana sales in Manitou, fearing the health effects on young users and what legal pot would mean for the community’s reputation. Nearly three years later, she remains committed to keeping pot out of children’s hands but credits marijuana revenues with breathing new life into urban revitalization efforts. The windfall offers a taste of what the city of Colorado Springs left on the table in July 2014, when city leaders exercised an opt-out provision and voted to ban recreational marijuana stores. A much better guide might be found in Denver, where tax revenues offset the expense for pot enforcement while helping to fund a variety of city services. In 2016, a year in which the marijuana industry in Colorado took in about $1.3 billion in sales statewide, the city of Denver raked in $20.6 million in municipal tax revenues on recreational sales alone, city figures show — nearly double the $10.6 million collected after Denver’s recreational pot stores opened in 2014. Recreational pot stores in Denver are subject to a 7.15 percent city sales tax — or the city’s standard sales tax of 3.65 percent plus a special tax of 3.5 percent. In addition to Denver’s municipal tax revenues, the city’s share of state tax revenue in 2016 reached an additional $4.4 million, according to the figures, provided by Denver city spokesman Daniel Rowland. While Colorado’s second-largest city has struggled to stay on top of crumbling infrastructure — it faces an Environmental Protection Agency lawsuit for failing to adequately address stormwater runoff, for example — Manitou Springs has leveraged its pot sales tax collections to make sweeping investments in infrastructure. In 2017, the town plans to spend $7.6 million in storm drainage upgrades — compared with $206,000 in 2013. Much of the increase is due to federal grant relief that likely wouldn’t have been realized without pot-related spending power, said Rebecca Davis, Manitou’s director of finance. Meanwhile, general fund operations have doubled in the past five years, from about $4.9 million in 2013 to a planned $10.1 million in 2017, the town budget shows. Spending initiatives include town government-wide salary hikes that will bring the community’s employees in line with recommendations from a 2015 paid study by Evergreen Solutions. A fatter general fund also allowed Manitou to replace the roof on its fire station. The city bought a new fire engine last year and plans to buy another this year to replace aging units. 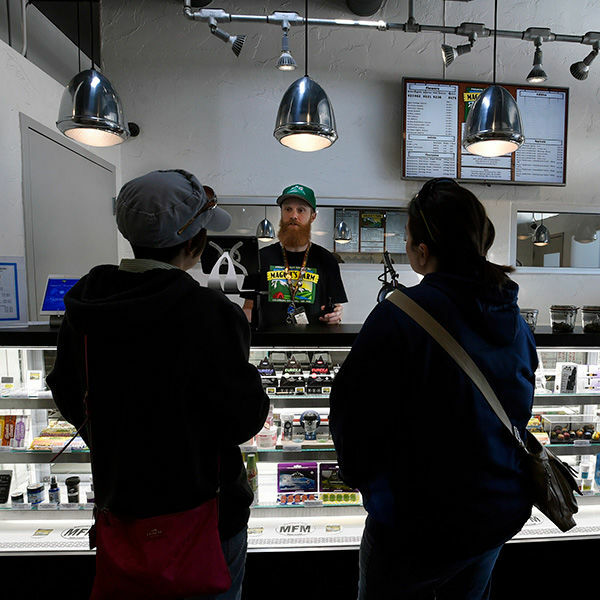 Maggie’s Farm became the first recreational marijuana store to open in the city and in El Paso County, at 4:20 p.m. July 31, 2014, and was joined by a second store, Emerald Fields, April 1, 2015. 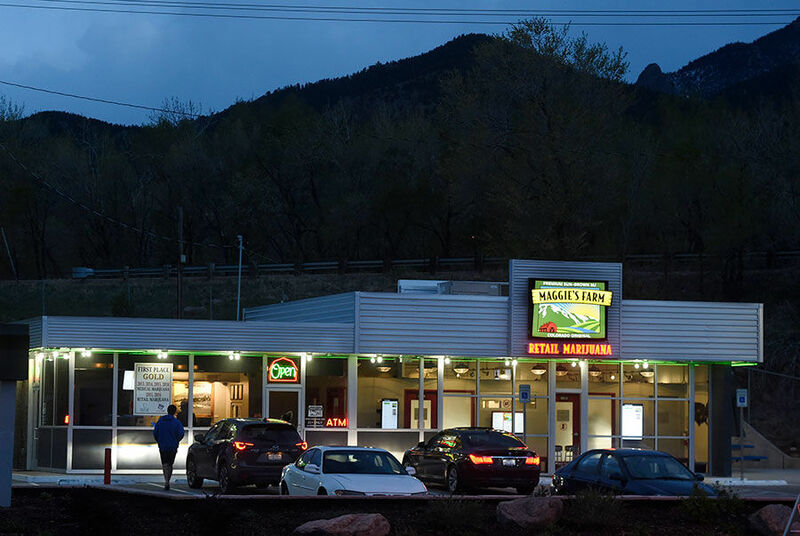 While pot-related cash flowed into Manitou, elected leaders in Colorado Springs stayed firmly opposed, voting to restrict and eventually close cannabis clubs and implementing tougher zoning restrictions on medical pot businesses. The April elections ushered in fresh perspectives on the issue, but it remains to be seen whether policies on recreational pot will change. The Gazette reported last month that new City Council members Richard Skorman and Yolanda Avila and second-term Councilwoman Jill Gaebler believe voters should decide whether to permit recreational sales, though a ballot measure is likely to be opposed by Mayor John Suthers, an avowed foe of recreational pot. Morrison helped found Manitou’s URA in 2007 in hopes of improving and modernizing a stretch of Manitou Avenue that begins at its eastern entry archway. The authority receives sales tax collections generated within its project boundaries, and both stores fall within that zone. As a result, the group receives about one-third of Manitou’s share of pot taxes, leading to an eye-popping, 35-fold increase in revenue. The infusion will help the URA tackle the first phase in an effort to beautify and modernize the Manitou Avenue corridor beginning at the town’s entryway arch — buying new sidewalks and curbs, burying unsightly utility lines and erecting a pedestrian bridge over Manitou Avenue to improve safety on a multiuse path. Many of the improvements should be complete within a year or two, she said. “This will really spark a lot of changes if it is done properly,” Morrison said. Pot alone cannot explain rebounding fortunes in Manitou Springs. The town has also benefited from a sharp rise in consumer spending that arrived in 2014, on the heels of back-to-back disasters in the form of the Waldo Canyon fire in 2012 and catastrophic flooding in 2013. Town leaders call Manitou’s experiment with legal pot a success, crediting their careful preparations before pot stores went online. 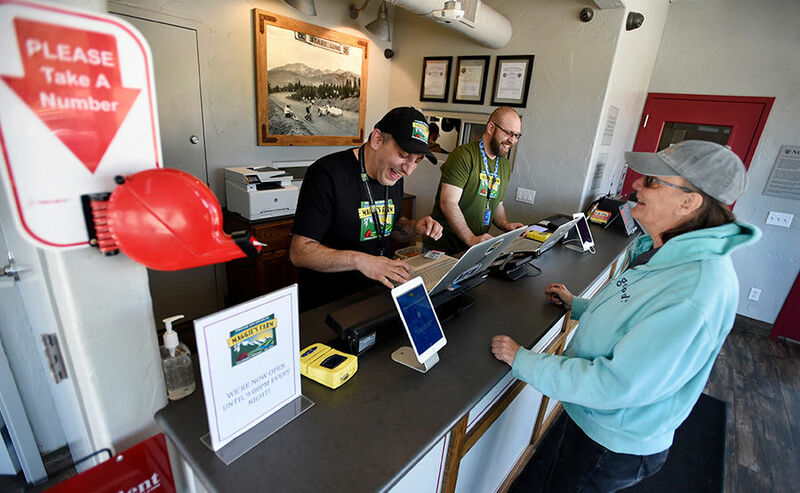 “Even before the dispensaries were coming online, we were already in an upswing, and the economy was doing really well,” Manitou Springs Mayor Nicole Nicoletta said. Increased spending brought a statewide boon in 2016, experts say. “Tourism has been way up the last year or two in Colorado,” said Mark Radtke, a Colorado Municipal League research analyst who credited lower gas prices for fueling an uptick in road trips. The group analyzed sales tax collections in 19 cities across the Front Range and found an average bounce of 4.5 percent last year, Radtke said. Colorado Springs didn’t need recreational pot stores to more than double the average, finishing out the year with a 9.6 percent increase. Resort towns including Silverton and Estes Park also enjoyed a resurgence, with increases of 15.5 percent and 7.5 percent, respectively. “We created rules and regulations that are very, very strict and definitely took into consideration the concerns of the people,” said Nicoletta, who sat on the town council at that time. Among the steps the city took to control pot commerce was a rule limiting consumers to one purchase a day. Products must be organic, clearly labeled and tested for pollutants. The council recently approved a request to allow the stores to extend operating hours until 9 p.m., up from 7 p.m.
Manitou also outlawed commercial grow operations, cutting down on complaints over odor. “I don’t smell it here like I do in Colorado Springs,” Nicoletta said. Former Mayor Marc Snyder, who pushed to allow recreational sales in Manitou Springs, said the passage of time has tamped down on opposition. Although Manitou enjoys a monopoly on recreational pot sales for now, Nicoletta says she has an open-door policy should Colorado Springs’ elected leaders want information on the pros and cons of the pot trade. “I would tell them to come talk to us,” she said.